A snowboarder who posted a viral video of himself chasing a moose down a ski hill in Quebec has been condemned online. A snowboarder who posted a viral video of himself chasing a moose down a ski hill in Quebec could now face harsh fines. In the 30-second video, he is heard screaming as he films a moose running away from him down a hill at Le Massif de Charlevoix, a ski resort about 90 kilometres northeast of Quebec City. The moose falls as it tries to get away from him, then it rushes into a wooded area. The video was shared on Facebook by the sports website The Bleacher Report and has amassed half a million views since being posted earlier this week. It was forwarded to Le Massif and now Quebec's Ministry of Forests, Wildlife and Parks is investigating the incident. The ministry has not ruled out that the snowboarder may be fined, but it has to "validate certain details," it said. The video was first posted on the snowboarder's social media and the account has since been deleted. Thousands of comments condemn the snowboarder's behaviour and the ski resort is joining them. Katherine Laflamme, a spokesperson for Le Massif, said that at this time in the season moose are already stressed because their fat stores have been largely depleted and they're tired. "They are very vulnerable so it's important for the people to just walk around them, stay down, stay as far away from them as possible," Laflamme said. 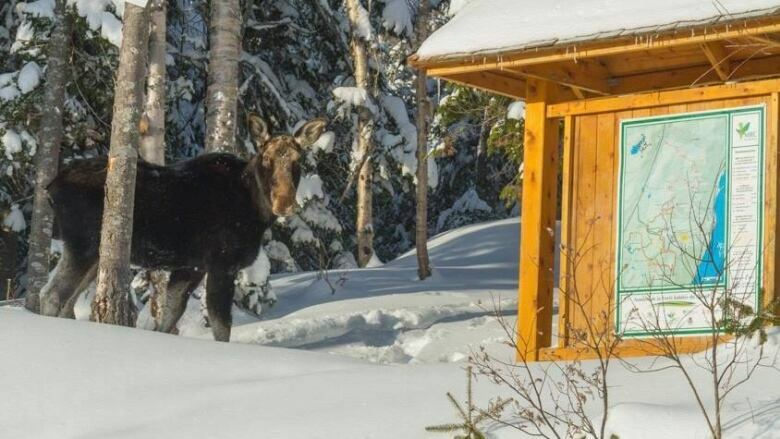 The ski resort has posted a warning to its Facebook page asking people to steer clear of moose this time of year. The post says that because of the amount of snow the area has gotten the animals are seeking shelter on the resort's hills.